Al Fin Energy: Underground Coal Gasification: One Path to Clean Coal Power? 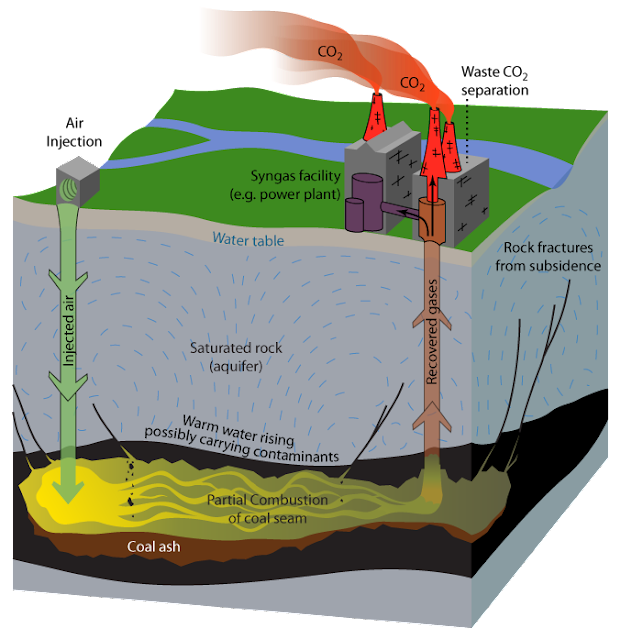 Underground Coal Gasification: One Path to Clean Coal Power? The writer known as "Rembrandt" provided a very useful article on underground coal gasification at the Oil Drum blog. The images shown below are all taken from Rembrandt's article. • The 1 km deep 5 MW coal pilot carried out by ENN in China that ran for 26 months. The Chinese government last month signed a 1.5 billion USD commercial partnership with the UK government for commercial development of the technology to be deployed in Inner Mongolia. • The Swan Hills project supported by the government of Alberta in Canada that should start in 2012 and become operational in 2015. The 300 MW syngas electricity plant is intended to be equipped with a carbon capture and storage facility. The commercial project follows a trial project in the region which successfully gasified coal in-situ at 1.4 km’s of depth. The latest standard of the technology incorporates horizontal directional drilling. To obtain the gas two wells are drilled, an injection well which brings steam and oxygen or air underground to ignite the coal seam and maintain the process, and a production well which pumps out the raw syngas. 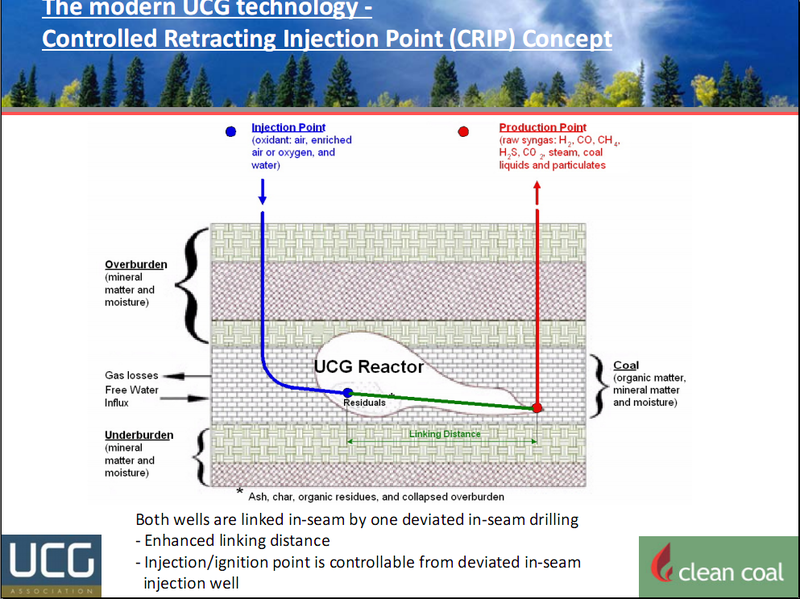 Previously vertical wells were used which are difficult to connect and limit control over the formation of the underground cavity as they cannot be steered. Today's horizontal wells can be connected using a magnetic target and detector positioned in the tip of the wells. The injection well is retracted along the borehole to gasify the coal which flows to the production well. The process is monitored above ground based on measurements of pressure, temperature, gas flow rates, gas composition at the wells. These are informed by simulations carried out to model the process. The control of the process comes from the injection of the oxidant, as too low or a halting of flows will stop the process. Several estimates have been made of the cost of an electricity plant based on UCG syngas. The main physical variables are the quality of the coal, depth and thickness of the coal seam, linking distance of the injection and production well, distance between the cavities, and sweep efficiency. The calculations based on theoretical and actual operations point to a cost range of 1 to 8 USD per GJ of produced syngas. The main cost variation is the usage of air or enriched oxygen for injection, the thickness of the coal seam, and the depth of drilling. 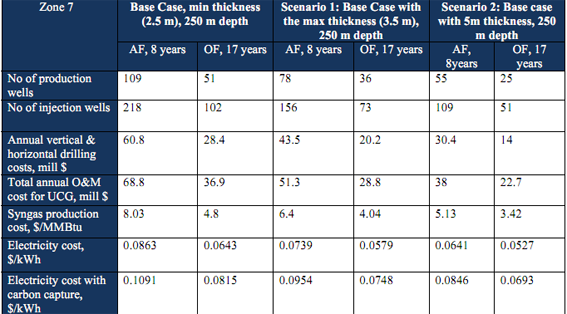 The later two factors determine the number of wells that need to be drilled and their required length. 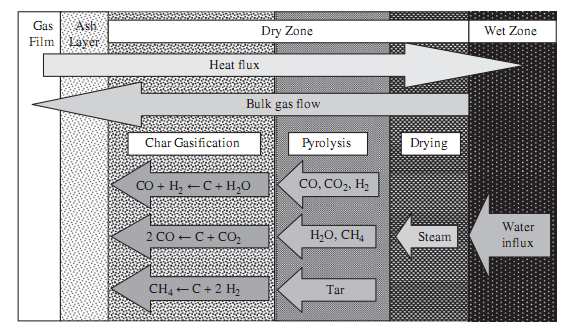 Oxygen-blown gasification is preferred in case of adding Carbon Capture and Storage technology. • The estimate of Marc Mostade of Clean Coal is a production cost of 2.5 to 4.5 USD per GJ of syngas, based on a 800 meter deep 500 MW thermal size UCG plant and a coal seam of 4 to 6 meters thickness at 800 meters of depth. The difference is caused by the usage of air-blown or oxygen-blown syngas. Information about the variables underlying his calculation can be found in his ASPO 9 presentation. • In 2007 GasTech carried out an analysis of costs based on coal in the US Powder River Basin using air-blown and oxygen-blown gasification. These were estimated at a cost of 1.5 to 2.4 USD per GJ of syngas. • In 2011 the School of Public and Environmental Affairs of Indiana University calculated the production costs for air-fired syngas via UCG in the state of Indiana in the US at 4.6 to 7.7 USD per GJ of syngas for respectively syngas produced via enriched or air, assuming a coal seam thickness of 2 to 3.5 meters at 200 meters of depth or more. Until the potential problem groundwater contamination with coal tars can be worked out, widescale adoption of this technology near populated zones is unlikely to take place outside of China and perhaps Africa. But it is quite likely that a variant of in situ coal gasification will be adopted within the next 20 years -- if crude oil prices continue to trend upwards and if national governments continue with their suicidal anti-nuclear policies and general policies of energy starvation. The general technology approach is not that difficult to implement, and with further refinements over time it should be possible to prevent groundwater contamination. In selected locations where environmental concerns are not as widespread as in most western nations, this technology is apt to go forward within the next few years.